Due to popular demand, Michael and I are going to start adding blog posts about the restaurants in Nashville we have tried. We created a list of 60 and have already visited many of them. And we will definitely be adding to our list! Many people have asked me for a copy of the list. So here you go. *Note: #40. Fish and Co. is no longer open. We will replace that restaurant with a new one. 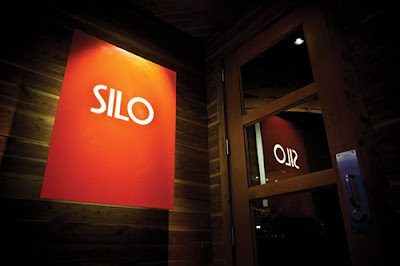 History: Recently opened, Silo claims to be elevated southern cuisine, a 'farm to fork' restaurant. The Executive Chef, Clay Greenberg, changes the menu daily to take advantage of seasonal produce from local Tennessee farms. Paul Cercone, collaborator and Artisan Baker, explains the name of the restaurant by saying, "Silos speak to things worth saving, like the Southern traditions of working hard, having fun and enjoying what you've grown or raised around a shared table." Parking: Street parking in the Germantown neighborhood. It was free but we had to walk a few blocks. Atmosphere: Cool and contemporary with southern flair. Cedar board paneling on the wall. Water poured from Bullet Rye whiskey bottles. Servers wore jeans and plaid shirts. Service: The service was awesome. A lot of Nashville restaurants have really solid food or hip atmosphere but they usually lack on service. Our server was professional. You could tell he has been in the business for a long time. He was on the mark. We were so impressed by the server, the first thing we did when we got home was write a review on Open Table raving about the service. Menu: Simple, upscale southern. Flavors were on point. The menu the night we ate at Silo. It changes daily, so there is always something new to try out. I keep forgetting to take a picture of my food before I eat it... But this is tasty Falls Mill grits topped with an onion jam. DELICIOUS! Silo has side dishes which are huge portions to share with the table. So we ordered grits to share. Best appetizer hands down. These are crawfish beignets, like a savory donut. It was served with a delicious remoulade, sort of like a fancy tartar sauce. I ordered Black Grouper which was set with parsnips, bacon, orange and jalapeño salad. It was fresh and yummy. This, again, is photographed after I had taken a few bites. The portion sizes were really generous. -Side to share: Mac n' Cheese. Ok, we didn't actually order this because I was really craving grits but from all who have eaten at Silo - best Mac n' Cheese in Nashville! Yum yum. Great service is underwhelming these days in a gastronomic culture. You'd think it wouldn't be! SILO looks amazing! Steve and I went here for brunch this Sunday because of your recommendation and it was delicious! We got the deviled eggs three ways (sweet potato and apple was the best), kale salad, and french toast. Service was great!